Indiana and Illinois share several rivers and streams and the state of Illinois is also very much a "river state" In fact the recognizable shape of Illinois is defined by the Wabash, Ohio and Mississippi Rivers, as can be seen on this map (courtesy of geology.com). During the past few years I have been fortunate enough to have traveled the watery outline of Illinois plus many miles of rivers within the state borders, including the entire length of the Illinois Waterway. Many people think of the southern states as Mississippi River states but Illinois has more miles of the Mississippi River than any other state. As I traveled many of the Rivers in and bordering Illinois I became intrigued by what is called the Illinois Waterway. This river system is the only navigable waterway connection from the great lakes to the Gulf of Mexico. The system includes the Illinois River, the Des Plaines River, the Cal-Sag Canal and the Chicago River (or Calumet River depending upon where one would enter or exit Lake Michigan). As I cruised the Illinois Waterway I discovered a river of many faces. From remote places of great natural beauty to the skyscrapers of Chicago and about everything between these extremes. I am considered a naturalist and certainly do prefer the most natural of landscapes but the exception to that was the thrill of cruising on the Chicago River at night. It is amazing to slip along quietly on the dark waters among the huge towers, lights, bridges, traffic and many people. Chicago is a beautiful city from the river and the Lake Michigan coast. That experience alone made the trip from St. Louis worth-while. We face challenges on all rivers in the U.S. and the Illinois River is no exception. Backwater silting is a serious problem as many of the lakes and wetlands along the river are filling in with agricultural run-off. 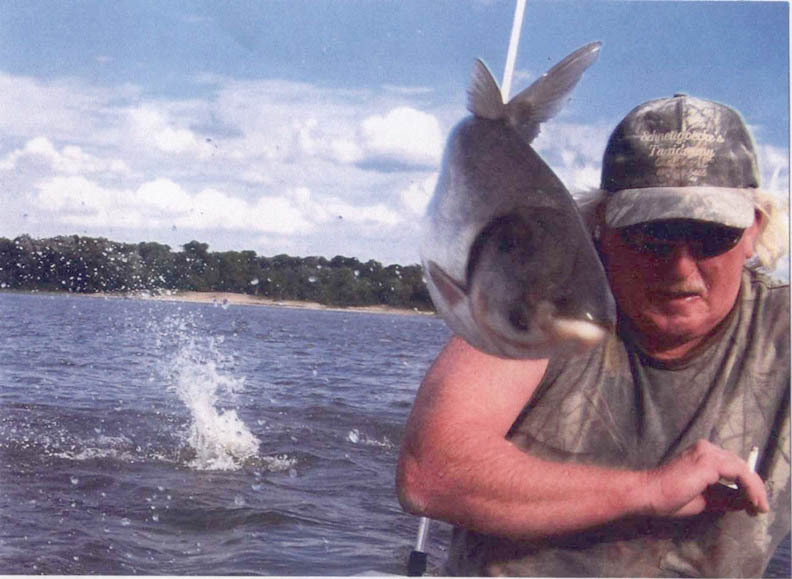 Another major problem are the Asian Carp. These fish were released into catfish ponds in the south to control algae but found their way to the Mississippi River during flooding. As they move upriver into the tributaries like the Illinois River, this invasive species are dominating the food source of other fish. They average 14 to 16 pounds and some grow to as much as 60 pounds. Boaters must be careful because they jump out of the water when startled by the sound of a boat motor. One may go for many miles and see no sign of them, then encounter them suddenly. Most of the time their jumping provides entertainment but getting hit by one on a fast moving boat can be painful. The problem is not as frightening as the mock poster at the right but hopefully something can be done to reduce their numbers. One Illinois community is bringing attention to the problem by having an annual "Redneck Fishing Tournament". Fishing poles are not allowed but about anything else is to catch the fish, including nets and clubs. Bath, Illinois has been featured on several documentaries for their unique event. Most people have no taste for the fish or won't try it but there are some fisherman who have found that the Asian market in some large cities will buy the fish and so they are being harvested. 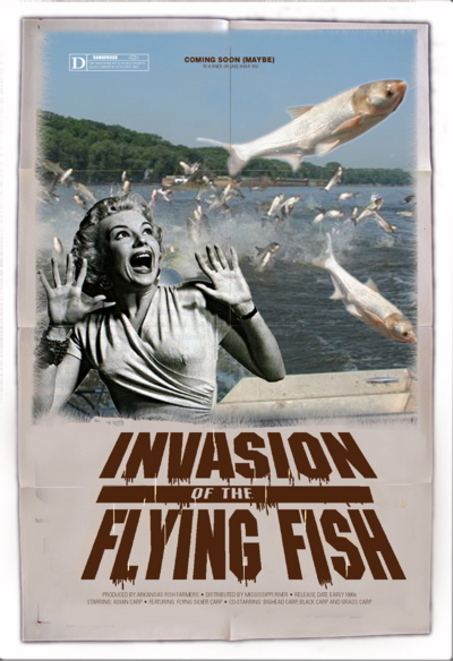 One of the fears is that the fish will make their way into the Great Lakes. To try to prevent this an electric barrier has been installed in the Illinois Waterways about 50 miles below Chicago. So far this appears to be working. Another great thing about the Illinois Waterway is the cities and towns along the shore. Listed are some of the features that I found in these Illinois communities that make them "River Friendly". As a traveling boatman I appreciate river towns that embrace their river heritage by keeping their riverfront beautiful and accessible. Joliet...Historic downtown with free overnight public docking next to a nice park, for transient boaters. Ottawa...Also historic and beautiful city that caters to traveling boaters. They provide a free overnight dock and everything needed is close by. The Fox River flows in at Ottawa providing good anchorage. Hennepin...Great little river town! They have plenty of public docks and ramps that are close to many conveniences. This pretty town is on high enough ground that there is no levy or flood wall blocking it from the river. Peoria...With a very active and beautiful riverfront Peoria is a great river city with plenty of boating activity. For a fairly large city, I found that Peoria is small-town friendly and accommodating. Photo is of Peoria riverfront. Havana...Brick streets enhance the downtown's charm which is close to boat ramps, docks and a marina. Beardstown...Pretty town with much to offer river travelers. They overcame being cut-off from the river by a floodwall by designing a catwalk on it and easy access over the wall from the public dock. Grafton...At the mouth of the Illiinois River, Grafton has everything one might during for a long river trip including a marina, restaurants, stores and lodging. As with all my river travels, I have kept journals, taken many photographs and drawn maps of my travels on Illinois Rivers. The Illinois Waterway is somewhat overlooked by many paddlers and boaters and I have found that there is little information available for people who want to explore it. Given this and the fact that it is a great resource, I decided to write the Illinois Waterway Guidebook. As with my other river guidebooks this is a complete guide with detailed section river maps, beginning at the mouth of the Illinois River and ending at Lake Michigan. This guidebook has it all! No cruising guides, charts or digital sources have as much detailed information in one source. Don't chance running out of fuel, food or supplies. Know where the hazards are. Be prepared for your river cruise or float by having all the information in one book, plus listings of great places to visit or stay. Information about cities, towns, and communities along the river that are "river friendly"